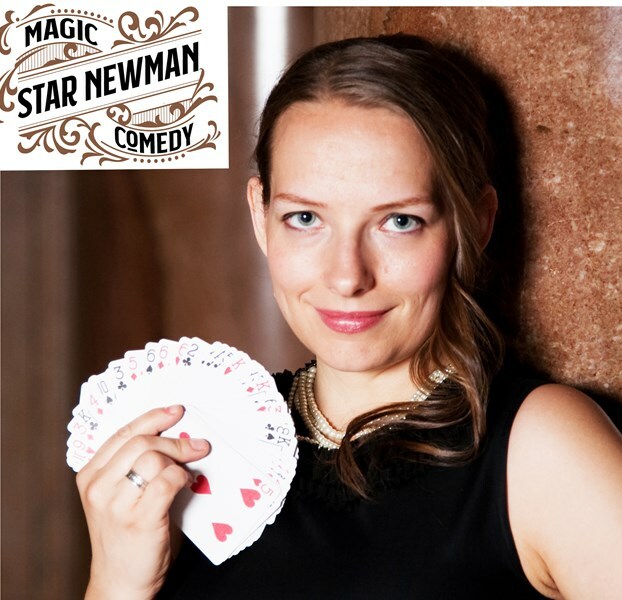 Star Newman has been performing magic professionally for over 2 decades. 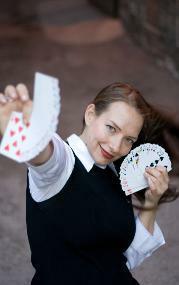 She holds a BA in Theatre and has performed magic across the country and around the world. Her extensive experience allows her to adapt to the the needs of her clients. Large or small audiences, varied backgrounds and performance situations are no problem for this seasoned pro. Her magic and comedy are funny but never offensive. That's why she has been trusted by clients such as Target, Delta Airlines, Dart Transit, Macy's and the Minnesota State Fair as featured entertainment for their events. Her years spent on stage as an actress also make her the perfect MC or Host for your event. Interjecting magic into your Awards Program, Fundraiser, informational meeting, or trade show is a great way to make the event (or your message) memorable for everyone. Whether onstage creating an interactive and modern magical experience at your event, or mingling in a crowd to break the ice or ease stress as people wait in lines. You will be 100 percent satisfied with your choice. Star's passion for performing shines through in her performances mesmerizing her viewers with pure wonderment. Through out audience members help out on stage and from their seats. In addition to stunning magic her performances include a truly unique escape, mentalism and an original illusionette that gives your guests a peek at what really happens when a magician puts a lady in a box and twists her up. Equally as unique, her close magic is much more than just card tricks, she uses coins, jewelry, rubber bands and more to dazzle your guests and make your even one to remember. While everyone is amazed by Star's eye popping magic; many rave about her engaging personality, contemporary wit and physical comedy. Pictures and videos tell 1000 words please check them out and see why audiences around the country love Star Newman. Star was a professional in every way. She does an excellent job of interacting with the audience. Merry Christmas and thank you. Star was awesome! She was very accomodating and professional. She made our entire 'That's Entertainment' couples shower a huge success! Star held a wonderful performance for our Cub Scout Pack, ages 6-11. They loved the interactive participation and her energy. We couldn't have asked for anything more and many commented on how they'd like to see her perform for us again! Star brought a smile to the faces of everyone at our conference. She was talented, flexible and a pleasure to work with. She did a great job of engaging her audiance. She was great with crowds of kids and strolling. I think she would be just as great as a "stage" performer. We would hire her again. Please note Star Newman will also travel to Lutz, Mango, Land O Lakes, Odessa, Seffner, Thonotosassa, Brandon, Oldsmar, Palm Harbor, Safety Harbor, Zephyrhills, Dover, Valrico, Clearwater, Gibsonton, New Port Richey, Riverview, Sydney, Saint Petersburg, Dunedin, Holiday, Plant City, Tarpon Springs, Crystal Beach, Apollo Beach, Elfers, Ozona, San Antonio, Durant, Crystal Springs.